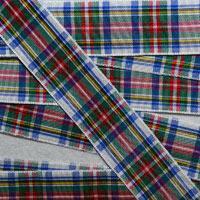 Our range of delightful Check Ribbons are brought to you from world renowned Ribbon manufacturers, Berisfords. Available in a selection of gorgeous designs and pretty colours including pastel pink, blue and black, Check Ribbons are useful for a variety of projects. Popular for craft projects such as collage and card making, Check Ribbons are also very useful for dressmaking projects as an attractive trim on tops and dresses. Ribbons are always a favoured item for wedding celebrations and over the last few seasons, Check Ribbons have become particularly fashionable for vintage themed celebrations and look beautiful on wedding invitations or for customising handkerchiefs and wedding favours to pass out at your ceremony. 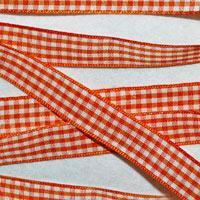 Check Ribbon, particularly the gingham design is often used for home baking projects such as jam making and bread baking.